You are panicked, short of breath, and the pain is so palpable that you cannot feel or think about anything else. The terror of picking up the phone to call a hotline not knowing who will answer prevents you from doing so. Or, even if you have the courage to pick up the phone, the sound of the person’s voice scares you & you hang up. We know this happens because over 30% of all people who call suicide hotlines do just that—they hang up as soon as they hear the human voice. 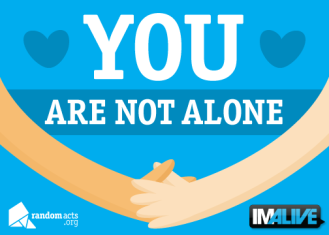 IMAlive.org has partnered up with Random Acts to train crisis intervention responders as part of Crisis Support Network. In 2010, the Kristin Brooks Hope Center partnered with To Write Love on Her Arms, the QPR Institute and PostSecret to launch IMAlive. 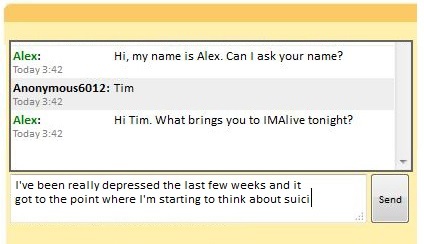 Since 1998, The Kristin Brooks Hope Center, founders of 1-800-SUICIDE, have responded to more than 7 million calls and chats from people in crisis and are the pioneers behind the IMAlive Network.